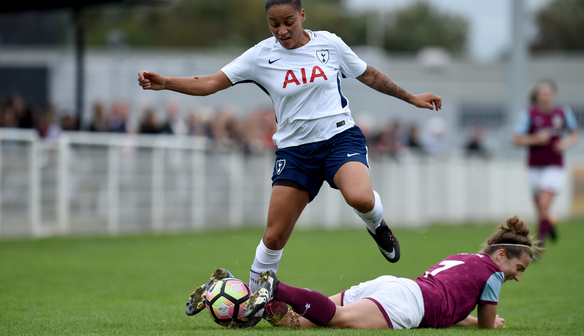 Bianca Baptiste’s third goal of the season sealed a shock Spurs win against higher-division Bristol City in the hosts’ first ever FA WSL Continental Tyres Cup fixture. Baptiste added to Lauren Pickett’s first-half effort to give her side the three points in the Group Two South section. Making their WSL 2 debut this season, Spurs’ result against their WSL 1 opponents gives them joint top spot in the group alongside Brighton, with WSL 1 leaders Chelsea still to play. Bristol made six changes from their impressive 1-1 draw at Arsenal on Sunday and were frequently caught out by the hosts’ pace on the break. Baptiste had the game’s first chance when put through by Katie O’Leary, but young keeper Aimee Watson got down well to save. Spurs stopper Chloe Morgan made crucial saves from Charlie Estcourt and Danique Kerkdijk before Baptiste wasted another golden opportunity, firing straight at Watson from 12 yards. Pickett then gave Spurs the lead on 41 minutes, pouncing from close range after Watson had been forced to acrobatically deny Lorca van de Putte’s sliced clearance. Baptiste doubled the lead halfway through the second half, latching onto O’Leary’s perfectly-timed through ball before coolly slotting home past the onrushing Watson. With Spurs’ diamond midfield proving difficult for Bristol to navigate through, Morgan was only called into serious action again when turning Millie Turner’s header around the post. Despite bringing on regulars Lauren Hemp and Carla Humphreys Bristol remained toothless in front of goal, and were shut out by their North London opponents. “We had a new formation thrown at us this week, but we went out there and we all gave it our best and came out with the win, a top performance from every single player from the top down. “We work hard for each other, if someone was struggling all we had to do was pick them back up, we worked together, that’s the main thing. “It’s nice to have Katie [O’Leary] back on the field, it’s been a while since I’ve played with her and it just goes to show that however long she’s been out for, she comes back and performs her best. “She played me a good ball, I had my one chance and I took it. “We should have really created more chances, we dominated possession and it was disappointing not to score and test the keeper in the first half. “Just a bit of a disappointing result, especially after the weekend. “I think they stopped us being creative, we used the width well in the first half and we knew we needed to do that more in the second. “We take every game as important as each other so we had footage on them, watched the clips and knew what we were coming up against so credit to Tottenham, they ground out a good result. Tottenham Hotspur (4-3-1-2): Chloe Morgan; Sophie McLean, Jenna Schillaci (capt. ), Renee Hector, Ashleigh Neville; Hannah MacKenzie, Maya Vio, Josie Green; Katie O’Leary; Lauren Pickett, Bianca Baptiste. Substitutes: Sarah Wiltshire for Pickett 58, Wendy Martin for Green 70, Coral-Jade Haines for O’Leary 84. Substitutes not used: Toni-Anne Wayne, Lucia Leon. Bristol City (3-4-2-1): Aimee Watson; Eloise Wilson, Danique Kerkdijk, Lorca van de Putte; Flo Allen, Millie Turner (capt. ), Poppy Wilson, Lily Woodham; Julie Biesmans, Charlie Estcourt; Olivia Fergusson. Substitutes: Aimee Palmer for P Wilson 18, Lauren Hemp for Woodham 63, Carla Humphrey for Allen 69. Substitutes not used: Caitlin Leach, Frankie Brown, Chloe Arthur, Yana Daniels.